Fox is completely asleep, Matt just broke apart a wire hanger to try and fish out a mystery item that is preventing our desk from closing, and I'm about to show you how to make a delicious salmon dinner. Pretty much status quo around here. Last week we had our first live weekly dinner and it went really well! We made a basil pesto pasta with grilled chicken and drank a lot of wine with friends and strangers alike. It was a good time. And we'll be doing it again this Wednesday at 8 pm EST! So join us! Below is the recipe we'll be making. It's extremely simple, feels fancy, and can be done in about half an hour. As a reminder, all the recipes we do as a part of our live dinner series will be: $20 or less for 2 servings, easy enough for beginners, and take less than an hour to prepare. Ok and here it is! Here's the flow of this recipe: start the salmon and croutons; while those cook make the salad; combine. Preheat your oven to 375 degrees and line a baking sheet with aluminum foil. Add the baguette cubes to a mixing bowl and toss with 1/3 cup of olive oil and a pinch of salt and pepper. Transfer the baguette cubes (your soon to be croutons) to the prepared baking sheet in a single layer, making sure to leave room for the salmon. Reserve any leftover olive oil in the bowl from the croutons. Place the salmon fillets skin side down onto the baking sheet alongside the croutons and sprinkle both sides with salt and pepper. Rub with a bit of the leftover olive oil from the croutons. 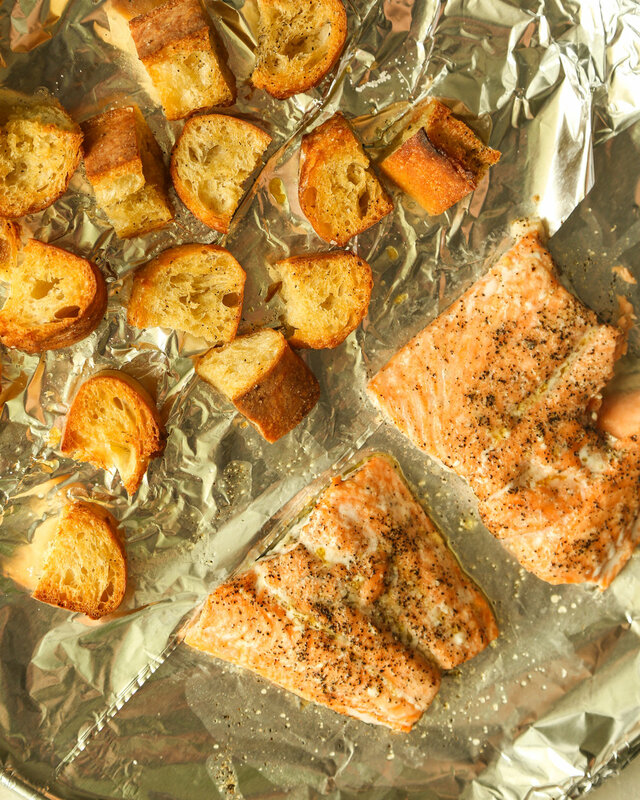 Bake for 13 - 15 minutes, or until salmon is cooked through and croutons are browned. Remove from oven and set aside. While the salmon and croutons are in the oven, make the salad. Add the garlic, salt, and pepper to your salad serving bowl and use a muddler (or really any small blunt object) to pound the garlic until it's formed a paste. Some small remaining chunks are OK. Add the anchovies or anchovy paste and egg yolk and whisk until it's all blended together. Whisk in the mustard and lemon juice, followed by the grated Parmesan. Finally, slowly drizzle in the olive oil, whisking the entire time. 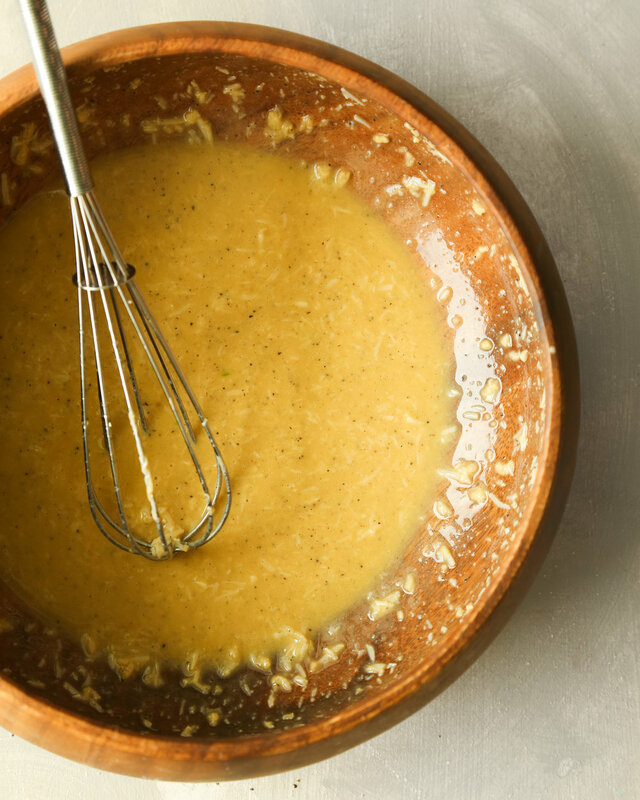 If you want a thinner dressing, add extra oil a tablespoon at a time until desired consistency is reached. Use tongs to toss half the kale into the dressing until fully coated. Add remaining kale and toss. Top with Parmesan flakes. Use a fork to tenderly break apart the salmon into bite-sized pieces, place on top the salad with the croutons and enjoy! Don't forget to join us Wednesday 09/04 at 8 p.m. to make this on Instagram live!